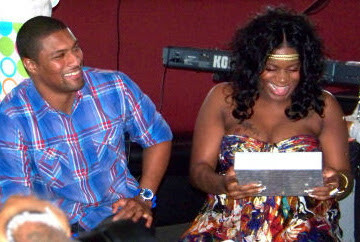 KayKiSpeaks.com: CONGRATULATIONS: Fantasia gives birth to her baby! CONGRATULATIONS: Fantasia gives birth to her baby! Monday, Fantasia & her highly profiled boyfriend welcomed their first child together. Antwaun Cook and Fantasia's relationship has been in the news since it began. This past summer she stunned the world with the announcement that she was expecting a child by her presumed married boyfriend. She's been keeping a low profile for a few months since that announcement, that is until yesterday! Fantasia and Antwaun welcomed a baby boy to their family! Congratulations to them!